Just in time for the upcoming Peanuts CGI feature, Boom! Studios (and their Kaboom! 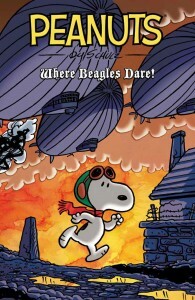 imprint) bring us a brand-new full-color original graphic novel, Peanuts: Where Beagles Dare! “Snoopy, the World War I Flying Ace, is on holiday in France but his leave is cut short when he’s recruited for a top-secret mission. Snoopy must dodge his way through no-man’s land, go deep behind enemy territory, and battle the Red Baron in the blackened skies above. Will Snoopy ever return home to quaff a few Root Beers with Woodstock and have dinner with Charlie Brown? 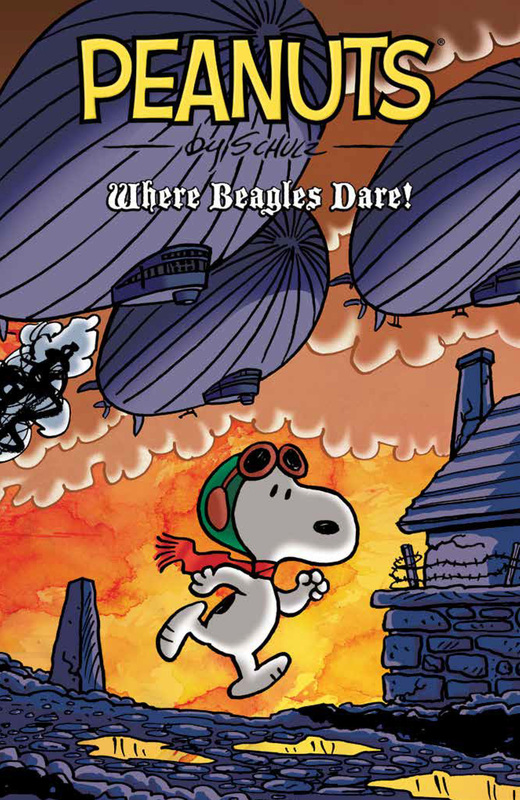 Find out in this original graphic novel featuring Charles M. Schulz’s beloved Peanuts characters and starring Snoopy!” Written by Jason Cooper and illustrated by Vicki Scott, Where Beagles Dare! is available later this month. Find out more at Kaboom’s web site.